This procedure is about maximising pasture utilisation without compromising pasture cover at critical times. In short, how to make animal demand fit your pasture supply. Getting a good match between animal demand and pasture supply is the basis of turning pasture into product. However, further gains can be made by grazing method and paddock subdivision. In environments where rainfall and pasture production are more variable between years, improving utilisation is difficult. Greater flexibility to manipulate stock numbers during the year and between years is needed. Monitor (between and within years) pasture supply and the number of stock carried. The maximum number of stock that can be carried all year is usually limited by pasture availability during the period of lowest feed supply. This is generally in the autumn and/or winter in both summer and winter rainfall zones. It is critical to get the time of lambing right to optimise the number of ewes that can be carried through the period of lowest feed supply (see procedure 8.2). Matching feed supply to animal demand requires a flexible enterprise structure that allows you to bring in or sell off stock depending on conditions. This is particularly important to be able to respond and capitalise in “better years”. In this way, the annual stocking rate may not change but there will be larger seasonal differences. Focus on seasonal adjustment of stock numbers to suit the conditions. All of these risks are real but they can be managed using stock assessment, grazing management, feed budgeting, and by working towards a more flexible enterprise structure. The above risks will be reduced significantly, if stock numbers are seasonally adjusted at pre-defined trigger points (stock condition, feed available, ground cover, etc). Am I lambing when my pasture supply is most reliable? Can I increase stock numbers during a one-in-five or one-in-ten year early break? Can I easily sell or find agistment for the livestock classes I carry through the months where pasture growth is not reliable? In general, how closely does the feed demand of my flock match my pasture growth? What options do I have for increasing feed supply in the slowest growth period, eg, supplementary feeding, deferred grazing, etc? Can I do anything to lengthen the periods of good pasture growth or move them forward or back? Do I store enough feed to cover bad seasons? Can I use cash reserves to cover bad seasons? The tools that follow will help you measure, manage and monitor any mismatch between pasture supply and animal demand and minimise exposure to changing seasonal conditions, both within a year and between years. They can help you make both strategic (ie, 1-5 years) and tactical (short term within the current year) decisions that relate to managing stocking rates, and answer the questions like: do you have enough stock, too few or too many? Stocking rate is the major determinant of pasture utilisation and profitability. A conservative stocking rate may be a sound, low risk choice for a sheep enterprise in a variable climate, but it may also be less profitable. Sustainable stocking rates are achieved when animal demand is actively managed to fit pasture supply. A feed year plan recognises the range of stock classes, pastures and forage crops across your farm and brings all the annual decisions on pasture utilisation together in one plan. Tool 8.5 provides a feed year plan template, and contains an example plan for the Central West slopes of NSW. Develop your own plan using the template in tool 8.5 to identify in advance when you will have high quality feed available on your farm. Does pasture supply meet animal demand? Use tool 8.3 (MLA feed demand calculator) to assess how well current animal demand matches your average pasture curve. You can calculate the percentage of pasture being utilised and liveweight produced per hectare, then test opportunities to better align feed supply and animal demand, eg, growing a winter active fescue, running more stock at peak pasture supply periods, changing your lambing date, etc. You can have two grazing systems with the same pasture stocking rate and utilisation but the system that better aligns feed supply with animal demand will be more productive and less risky. What animal factors can I change? Overall farm stocking rate; consider regional benchmarks for stocking rates or seek advice from local advisors on what is a realistic overall stocking rate for your farm and locality given the pasture species, soils types and soil fertility. Time of lambing; during pregnancy, feed requirements of ewes doubles. At 30 days lactation, energy requirements of ewes rearing twin lambs are over 3 times that of dry ewes. Match mid lactation with peak pasture growth to better match feed supply and demand. Time of sale; when surplus stock are sold can markedly effect feed demand. For example, sale of cast for age ewes prior to summer-autumn. Lamb or wether sales can be varied depending on seasonal conditions. Reproductive rate; running ewe genotypes with a high twinning percentage can be a way of using peaks in spring feed supply. Feed demand of ewes rearing twins is 25% higher than for those with single lambs. How long will a paddock last with a certain number of sheep in it? How many sheep can I graze in a paddock (for a certain length of time)? Short term feed budgets (daily, weekly, fortnightly) ensure production requirements can be met for a given stock class. Use the pasture benchmarks in table 8.1 in procedure 8.2 to identify the minimum pasture supply and quality required by your sheep classes. Calculate a feed budget three months ahead when planning your lambing or weaning paddocks, or for stock marketing (forward contracts). Doing a feed budget for lambing lets you know if there will be 1,500 kg DM/ha available for lactating ewes, or if you should be taking some action now to meet the nutritional demands from your stock. Tool 8.4 sets out how to calculate three month and shorter term feed budgets on paper. It includes examples to help guide your feed budget calculations. Increase intake: rationing intake by some classes of stock to create an opportunity to allocate higher quantities of pasture to other classes, such as weaners. Preferential allocation of green feed to priority stock on a regular basis also gives a better measure of pasture growth rates and feed consumption. It is often desirable to increase the intake of pregnant ewes or ewes rearing twin lambs. 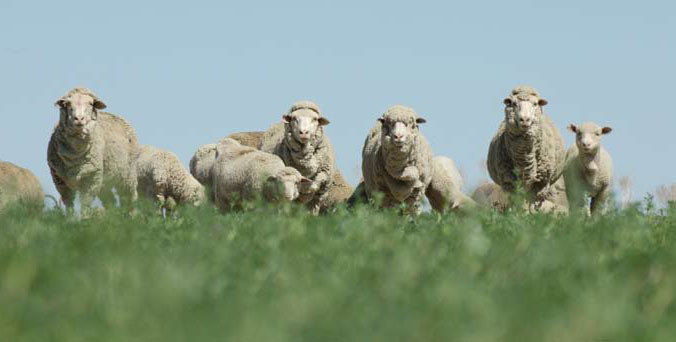 These stock can be given preference for the highest quality pasture and in a rotational system grazed ahead of the stock with lower feed requirements, ie dry ewes or those with single lambs. Add or remove paddocks from the grazing rotation to increase or decrease paddock rest periods. 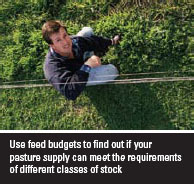 If pasture growth rates are fast, speed up the rotation by moving stock on quickly. Fast moves during periods of fast pasture growth give livestock access to the best feed before it goes rank or hays off. Remove paddocks from the grazing sequence in spring and consider fodder conservation options. When pasture growth is slow, slow the rotation down, then reduce stock numbers or supplement stock to allow time for pastures in rested paddocks to re-grow before grazing. Regularly monitor pasture and animal condition. Monitoring helps you track changes in pasture quantity and quality or animal demand to ensure pasture and animal production targets are met. Tool 7.6 in Grow More Pasture contains pasture monitoring tools. Tool 10.1 in Wean More Lambs contains condition scoring guidelines for sheep. 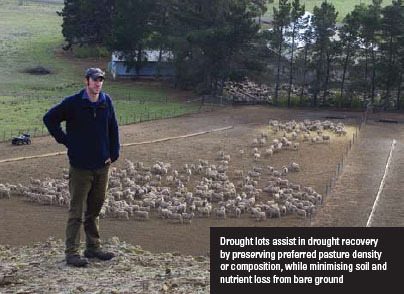 Repeated overgrazing without adequate rest can reduce ground cover, damage soil and reduce the ability of the pasture to “bounce back” with rain, rest or fertiliser. Using high density, short duration rotations to ration intake or control weeds. Review the grazing management guidelines in tool 7.5 in Grow More Pasture. If you can see obvious signs of patch grazing in paddocks (eg, bare hilltops, sheep camps and rank grass in other parts), then utilisation can be improved. The issue of uneven grazing often has to be dealt with before stocking rate is increased. Running more stock will increase pasture utilisation, but any areas that are already overgrazed will be grazed even harder. 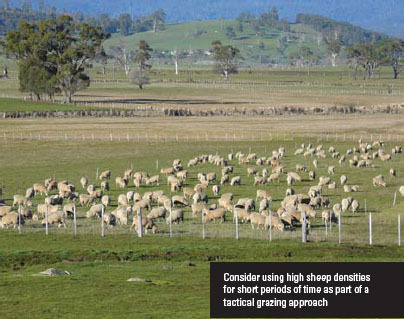 Reduce selective grazing by either reducing paddock size and/or using bigger mobs to graze the paddock in a rotation. ‘Boxing up’ existing mobs and using existing paddocks for rotational grazing is the cheapest way to get started on evening up utilisation within paddocks. Watering points: pasture utilisation will tend to be highest close to watering points. This is especially noticeable in large paddocks with a single watering point. Compared with set-stocking, implementing a more intensive rotational grazing system will give more precise control of stock intake and more even pasture utilisation. Tool 8.7 outlines a method for getting started with rotational grazing and is further developed in the MLA Tips & Tools “Getting started in simple time-based rotational grazing”. Intensive rotational grazing systems can help you implement a simple four paddock rotation (see signposts). When trying to increase pasture utilisation, start off with one or two paddocks as a trial, to practise pasture and stock assessment skills and feed budgeting. It may be the better land classes, or paddocks where there are obvious signs of poor utilisation (too much dead pasture, low legume content). It is often best to make incremental lifts towards your stocking rate target, which will allow you to increase confidence and build skills. For example, you might decide to increase the stocking rate in winter by 10% this year, based on analysis of the average pasture supply curve and the amount of dead pasture left in paddocks. One option could be to retain an older age group of ewes or more wethers, rather than purchasing stock if the risk of introducing disease is a concern. Determine what constitutes a ‘drought’ or a dry year for you in your environment. For example, it may be a failed spring followed by a failed autumn. Set trigger points for action. That is, “If certain weather conditions occur, I will take this particular action now” (sell some stock, for example). Be ready for a drought/dry year. This will include keeping adequate feed reserves, having containment areas/drought lots, and a plan to determine which stock will be sold and which will be kept and fed in the drought lot. Decisions about which stock to keep or sell will depend on their value at the time, the probable cost of feeding, the value of any production that would be gained if they are kept and their future replacement value, should that be necessary. There are a number of publications and tools which can help you prepare such a plan (see signposts). Stockplan®: a workshop to help sheep (and cattle) producers explore management options in the preliminary stages and during drought. To find out more, visit the NSW DPI website: www.dpi.nsw.gov.au and use the search facility to find Stockplan.